Another handmade figural bar decanter marked evans ware 1980. 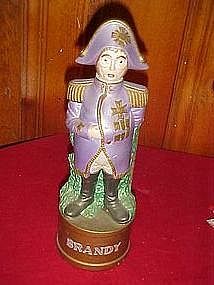 This one holds BRANDY and measures 12 3/4" tall. This is the famous Napoleon. Now we know why he kept his hand in his coat! Perfect condition. I have other decanters from this same maker that are listed and would make a great bar set.